With our decision to cut our time short in Europe we also decided to make the most of the time we had left. We passed up so many things we wanted to do along the way in Europe because we just could not justify the cost and now it’s time to live a little. Lauren and I love to ski/snowboard and we talked about a trip out west to Colorado for years before our world trip, but it just never happened. 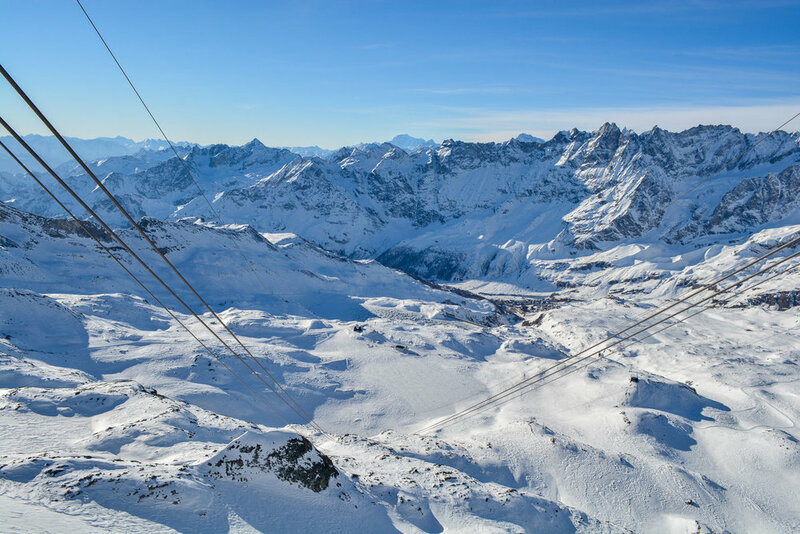 As an avid mountain lover, I was the most excited to visit Switzerland and what better way to see the mountains than spending 5 days on the slopes in the world-renowned Swiss Alps! 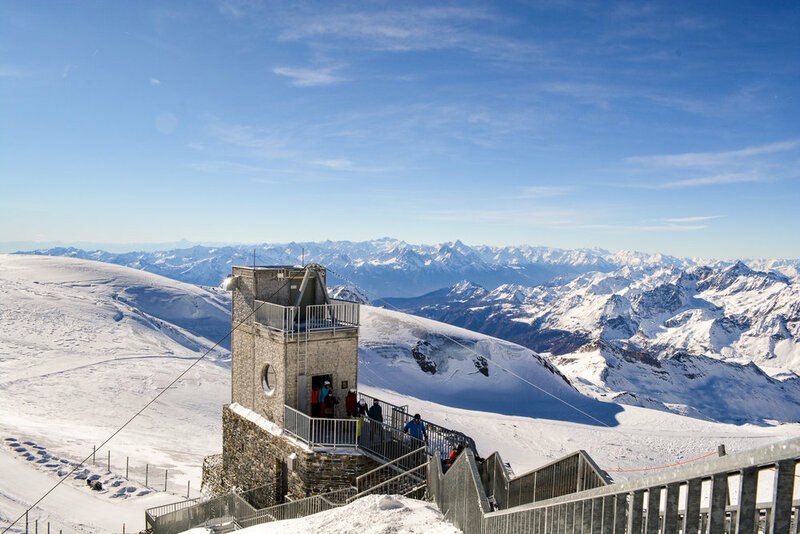 With a countless number of resorts to choose from I was clueless where to go in Switzerland for the best skiing/snowboarding, so I gave it a google and I found a way to kill two birds with one ski. My fascination with big mountains has only grown over my life time starting with Grand Tetons National Park, Glacier National park, Zion National Park, and continuing with Peru, Alaska, Morocco, and Scotland. Naturally, I have always wanted to see the Matterhorn. 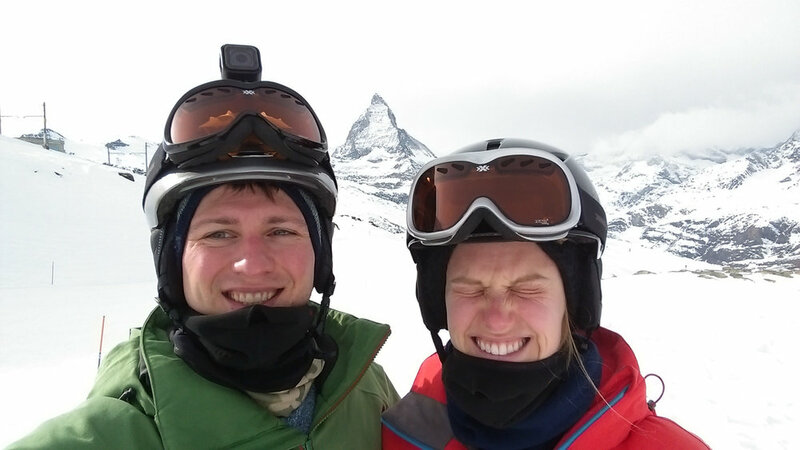 When Google told me that Zermatt was among the top three resorts in Switzerland and got us up close to the Matterhorn I was sold! Prior to this the biggest mountains I have ever snowboarded are the Appalachians in West Virginia at snowshoe and Timberline. Woooo! Sad, I know. And the biggest resort Lauren has been to is Killington in Vermont when her and her dad went there on a trip together. Yes, she wins. Looking at the piste (slope) map for Zermatt we were blown away at the scale of the resort. We could even buy an international lift pass and ski into Italy via the three connected resorts. Yes please! We booked this all up about a month out and then tried not to think about it so we wouldn’t burst with excitement. Making our way to Zermatt we landed in Geneva and spent a couple days to explore this historical city. It’s no secret that Switzerland is expensive so it came as no surprise when we had to cram ourselves into a tiny little apartment for the couple days in Geneva. The apartment complex reminded us of the communist housing projects we had seen in Prague. We feared the elevator might give out at any minute with the terrifying three inch drop every time you step into the death trap. The fun did not end when we arrived on the sixth floor to find our apartment. The hallway looked like the perfect set for a kidnapping or horror movie, just see for yourself in the picture. We slept easy only because there were two solid locks on our door. In the apartment we could literally roll out of bed to make coffee. Geneva was eerily quiet during our time there which may have been because it was just a short while after the new year and people were likely still on their month-long European vacations. Surprisingly, the city reminded us of Prague as we had flown in thinking that it would be more like the regal city of Vienna we had just left. 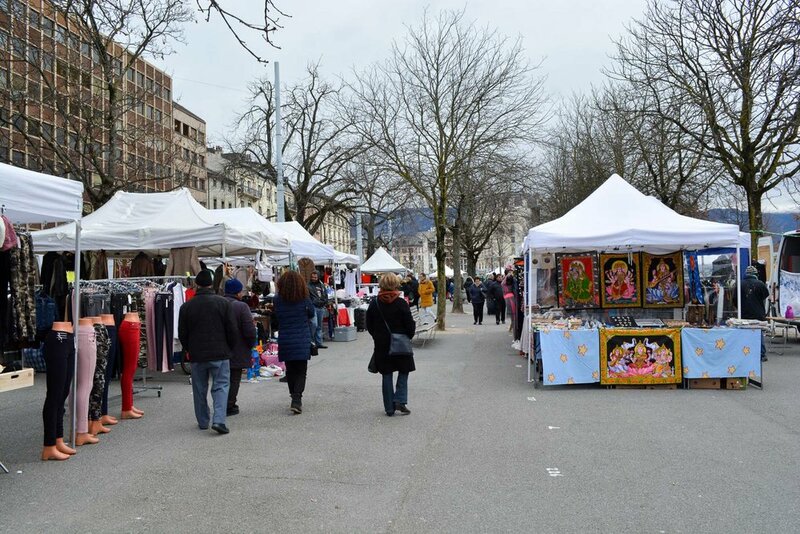 In our time there we visited a huge flea market and found a vegan stand which had vegan cheese for fondue! Perfect our place in Zermatt has a fondue set! 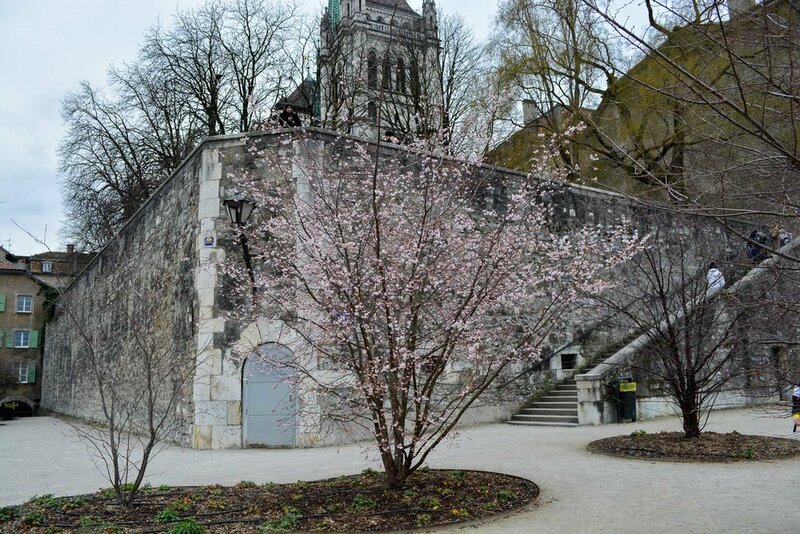 We saw the sights of Geneva easily in a day walking the historic downtown. The setting of the city at the edge of the lake and nestled in a valley of the surrounding mountains was a beautiful sight to wake up to each day. It had been a while since we had a date night and I finally picked up on the hints from Lauren that were becoming less and less subtle. It had also been some time since we had Ethiopian food and given that Geneva has many Ethiopian restaurants, I was able to find one with vegan options. I had a surprise for Lauren after dinner and had researched some clubs where we could go dancing. We soon learned why Geneva is such a sleepy town. We hunted around for a while to find the clubs I had pinned only to learn that their hours are midnight to five in the morning! Come on we’re not 21 anymore and happen to enjoy the daylight and the feel of a productive day. It seems like there is no middle ground for partying here as we couldn’t even find a bar for a drink. It’s like everybody goes to dinner, naps and wakes up to rage all night! We enjoyed parts of Geneva and were happy to have spent a couple days there, but we were ready to get on the train and head to Zermatt! Before we go it would be amiss for us not to mention anything about the Jet d’Eau pictured above which has come a symbol of the city at 460 feet high! The jet was not initially intended to be a landmark and started with a very practical purpose, as a safety valve for a hydraulic power network. Of course when we see a tall jet of water in conjunction with hearing hydraulic power network Tim the Tool Man Taylor begins to grunt in my head and I’m wondering how much power? To appreciate this symbol of the city we must first understand the humble beginnings of it which came about with some clever engineering. Not far from the city of Geneva the waters of Lake Geneva begin to flow out of the lake and into the River Rhone. In 1883 a hydro power plant was built along this outflow using turbines in the flowing water to turn pumps which pressurized two water systems, one for the city’s drinking water and the other was a high pressure hydraulic power network for industrial purposes. The high pressure network was used to power machinery, some of which was used to create electricity for the city. All that makes perfect sense, but you may be asking yourself so what’s with the jet then? Did you know water is an in-compressible liquid? Pretty cool right? But what happens when you put an in-compressible liquid into a closed pressurized system moving a high speeds? Nothing as long that water keeps moving, but things could go catatonic fast if for some reason that flow stopped abruptly with say machinery locking up or a valve accidentally closing. You have likely at some point in your life heard a strange banging inside the walls of a house when you quickly turned a water faucet on or off. The sound you are hearing are the pipes banging around inside the wall, but why would the pipes bang around you were gentle with the faucet. The answer to the question has a pretty cool name known as a water hammer and no you can’t hold it. A water hammer is essentially a change in energy occurring in the water when the flow quickly starts or stops (more commonly when it stops). Remember water is in-compressible so when the flow stops in a pipe the movement of the water or it’s kinetic energy must be transferred to a different type of energy because energy is not created or destroyed it merely changes states. The kinetic energy of the water is transformed into pressure which can create a spike and cause the pipe to swell (very slightly) or move around explaining that banging you heard behind the wall. To alleviate the significant concern for a water hammer to occur in a high pressure system, also providing the city’s electricity and drinking water, the engineers put in a bypass to blow off any unwanted pressure in the form of the jet. It’s my understanding that this jet was always flowing so it very well may have also just been the end of the line where the high pressure water was discharged after it had passed through the machinery and/or turbines. The original jet rose just shy of 100 feet which is not dwarfed by the 460 foot Jet d’Eau of today plus one more difference. The Jet d’Eau has no function today other than as a landmark as the plant became obsolete in 1963. Today this 460 foot jet of water is powered by two massive pumps spraying 130 gallons per second from the nozzle at an astounding 120 mph and at a pressure of about 200 psi before leaving the nozzle. The scenery only grew more beautiful along the tracks towards Zermatt. We spent the first couple of hours following the edge of Lake Geneva while making our way deeper into the mountains. At Visp we caught our connecting train up to Zermatt and noticed a strange third track in the middle which looked like it mated up to a gear for climbing. The hour-long train ride deeper and deeper into the mountains seemed to never end, searching for Zermatt around each corner. We could hardly sit still on train we were so excited plus we had a lot to accomplish when we got there in preparation of our first day on the slopes tomorrow. When the train pulled in, we made a bee line for our apartment to drop our bags off and begin our search for rental gear. We were a little disappointed that we did not see the Matterhorn while walking from the train station to our apartment, but we also didn’t know which direction to be looking in, figuring it would be obvious. Walking to the last rental shop on our price shopping list I saw two ladies insta-posing it up and wondered what in the world they were so excited about. When I turned around and saw the Matterhorn I had no clue how in the world we had missed it earlier with how magnificently it dominates the skyline. We ended up renting from the Bayard by the banhof train station mainly because they were the only ones with the heated ski boots Lauren wanted to try out. They conveniently gave us lockers to store our gear at the shop each night, so we didn’t have to lug it back with us up the hill each day. Lauren loved the heated boots by the way, highly recommend for those with cold feet on the slopes. With our rentals taken care of and lift passes in hand we went back to our cozy apartment to study the piste map for the next day. We were confused by the map because of how the graphic makes it look like the slopes would be visible from town, but we could only see a couple distant gondola’s going over some peaks…. It was not until we got on our first gondola the next day that we realized the mountains encircling the town were only the bases of the mammoths that surrounded us. It must have been so obvious to the people in our gondola that it was our first ride up the mountain with our swiveling heads and constant pointing. In the days leading up to our visit we started watching the snow report and noticed the Italian side of the mountain was closed for several days in a row due to high winds. We kept our fingers crossed that it would open up for at least one day while we were there. The open slopes were limited to about 1/3 of the mountain (gornergrat) on our first day, but we quickly learned that was way more than we could hope to ride in a single day. 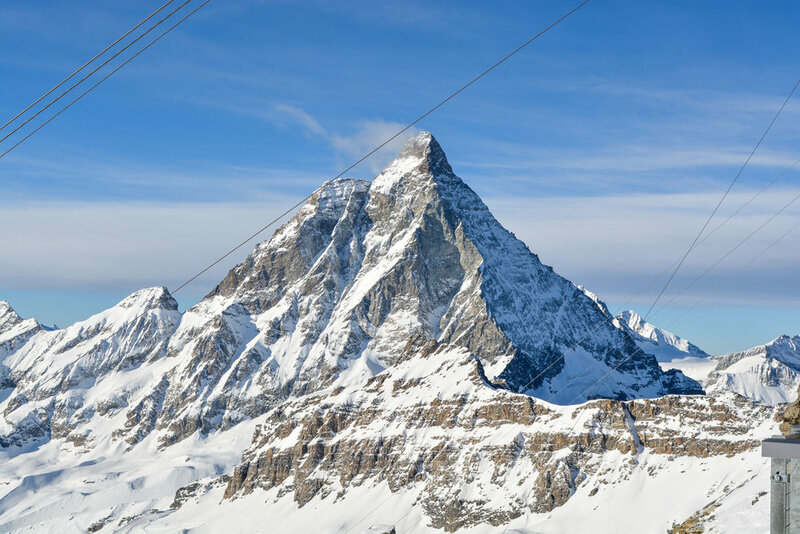 We had great weather on our first day and splendid views of the Matterhorn with each run down the mountain. We got six runs in over about four hours on the first day which may not sound like much until you understand that each run was about 12-15 minutes down the mountain averaging about 3.5 miles long with a vertical drop of 3,500 feet. We totaled 20 miles down the mountain that first day. For a comparison to the resorts back home like Showshoe and Seven Springs that would be about 30 runs down the mountain which on my best day I have only ever fit in about 15. 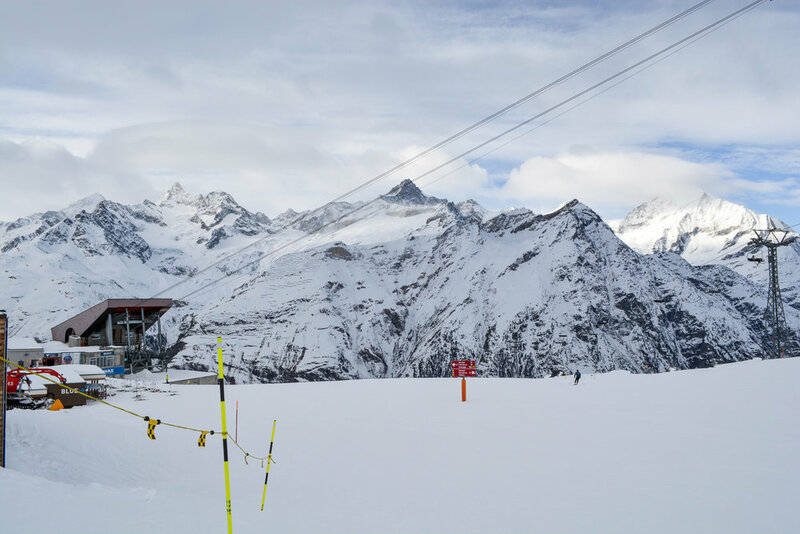 Oh, and the best part about the slopes at Zermatt, no lines at the lifts!!! We literally rode until we dropped the first day. Every morning at 8:30am I was on my phone checking the Zermatt app to see how much of the resort was open for the day. We were sad to see that again today the Italian side was closed for high winds, but on the bright side they had opened a new area for us to explore in the Matterhorn Glacier Paradise. On our ride up the mountain we began to understand why they would close parts of the mountain for wind as we watched the gondolas swinging in the gusts. Our first run down the mountain further reinforced our understanding of why they close parts of the mountain. The wind stopped us cold more times that I care to recall on our way down. Wind is one thing, but when you add snow and cloud cover to it things can get dicey quick. A few times down the mountain on this day we were in white out conditions only able to see a few feet in front of us because of rolling cloud cover and blowing snow. I happened to pick the worst day to go down one of the longer slopes sweeping across the base of the Matterhorn. It looked like a fun and long ride down. It certainly was a long ride down at 45 minutes but fun it was not. Flat sections of a slope are the worst fear of a snowboarder because if we somehow lose our speed we turn into turtles on our backs. We don’t have those handy poles skiers have to push through the flat areas. I swear the wind was toying with me because it seemed like every single time I found myself on a flatter section the wind would pick up from annoying to gale force and stop me cold. Lauren was such a good sport and offered me one of her poles to hold on to while she skated on her skis trudging us along to get off this bitter cold side of the mountain. When we finally got below the clouds and squalling winds the trail turned into what seemed like a cross country skiing course. There were even sections that went up! A new sport was invented on this day and we choose to call it cross country snowboarding. It involves a team of two, one snowboarder and one extremely compassionate skier, and works best when the skier is the most wonderful wife in the world. The sport is simple, every time the snowboarder stops because it is too flat or a gust of wind robs them of their speed, the skier offers a pole like a tug boat and pulls the snowboarder to the next downhill. It is an incredibly taxing sport for both partners and especially the skier so choose your partner wisely. I also recommend a slim snowboarder. We were both so exhausted at the bottom of the slope we only had a couple more runs in us for the day, making the tally for the day six runs and 16.5 miles down the mountain. At 8:30am in the morning our excitement level shot through the roof when we saw that they were preparing to open the Italian side of the mountain!!!!! We headed straight to the top of the mountain taking three different gondolas to get up to the 12,464 foot peak and were awestruck when we got there. The gorgeous weather gave us an endless view of mountain tops spreading in every direction. We could even see the highest peak in Europe, Mount Blanc, two countries over in France at 42 miles away! It took us about an hour just to get all the way up to the top and when we got there the 7,500 feet of elevation gain had us both feeling the altitude. From the highest point of the resort we of course went for the longest run Italy had to offer us at 8.23 miles long and taking us over 30 minutes to get down! We wished they had opened the Italian side earlier in the day so we could have taken advantage of the cheap beers at their ski up restaurants. Nonetheless we enjoyed an Italian beer with our lunch before working our way back up to the mountain tops to get back into Switzerland before the lifts closed for the day and stranded us. This is one huge glacier that we skied down!!!! I was so impressed with the trail length and vertical drop of our runs on this day that I grew curious how the Zermatt resort compared to the resorts in the Rockies I have heard so much about from friends. From the tippy top of the mountains down to the ski town in the valleys the vertical drop at Zermatt is about 7,500 feet and our longest trail runs were between 7.5 and 8.23 miles. 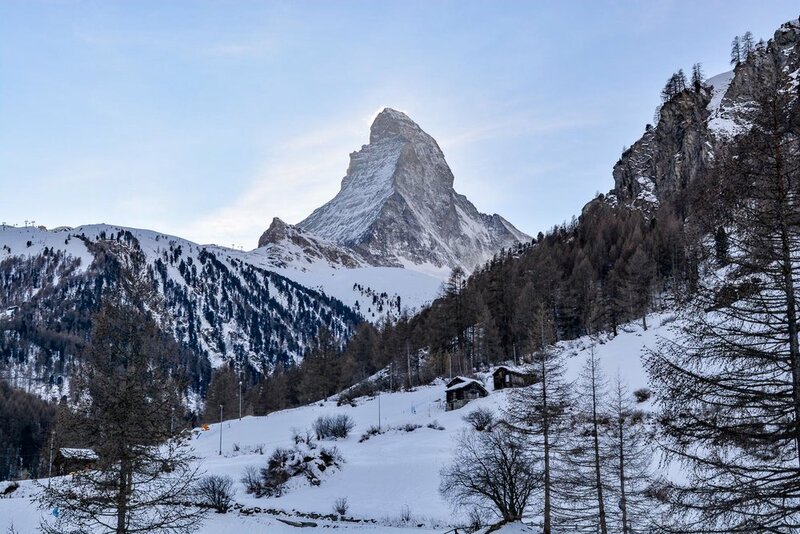 Trail length at ski resorts depends heavily on the vertical drop of the mountain and I was amazed when I found out that Zermatt had almost twice the vertical drop then the average resort in Colorado. We have ruined ourselves for places like Snowshoe and Seven Springs who have average vertical drops of about 750 feet. We knew we were in for another cold and windy day when we walked outside and looked up at the cloudy sky. We saw one new slope open in the Matterhorn glacier paradise and could not deny our curiosity. As we neared the top of the mountain, we guessed that we were in light cloud cover because as we began our descent it was very difficult to see the contouring in the snow. We had noticed this on our second day too and it seems like once we dropped below a certain elevation the visibility improved. On our way down both Lauren and I almost fell a few times because of the unexpected bumps we would hit without seeing. The trail was so steep I actually got lightheaded and started seeing spots in my vision from exertion or perhaps the quick elevation drop. I slowed down and after a few deep breaths continued the race down to keep Lauren in my sight. At the bottom we decided to retreat to the Hohtalli section of the mountains for some better weather. We managed four or five runs down the mountain for a total of about 16 miles. At the end of the day I was feeling fatigued and was not sure how I felt about a fifth day in a row. No matter how sore and fatigued I was, I could not say no to the slopes after glimpsing the beautiful day unfolding before us. We had saved a section of the mountain for our last day called the Sunnegga/Rothorn area. This area of the mountains had so many fun and winding trails we somehow found the energy for six runs and about 22 miles down the mountain! We know all of the run lengths and vertical drops because I tracked every run down the mountain on my Garmin Connect. I was excited to find out it also tracks top speed which if you know Lauren and I, of course turned into a competition. I concede that she is faster than me and has proven it on many races down the slopes of snowshoe and seven springs over the years. However, the question left unanswered is how much faster? Over the five days that I wore my Garmin my top speeds hovered around 44 mph. I tried several times to break the barrier, but could not seem to unlock any more speed than 44 mph. On the last day I passed the Garmin to Lauren for her last two runs down the mountain so she could clock herself. She clearly took this challenge very seriously with top speeds of 52.2mph and a whopping 55.7 mph! Somebody needs to teach her how to turn!!!! Our last day in Zermatt was a rest day. It was also when a snowstorm hit the area and dumped about 2 feet of snow on town. We were snug in our apartment doing some writing and going over pictures and videos of the past week while the snow gently fell outside. In the evening we ventured out to the only restaurant we had dinner in, which was the only one I could find on Happy Cow with decent vegan options (as in, not fries and a plain salad). Brasserie Uno had a cozy romantic atmosphere and the food was delicious! Lauren and I thoroughly enjoyed our vegan Swedish meatballs and talking with the staff. Halfway through Lauren’s dessert (I said I didn’t want any and Lauren held me to that only allowing me one bite when her delicious vegan lava cake came out) the power went out! The restaurant quickly lit some candles and a customer at a nearby table played some music from his phone and we continued our romantic evening with some laughs. About 20 minutes later, to the restaurant staff’s relief, the power came back on. We paid our bill and walked back to our apartment in the snow—which of course led to a snowball fight between us because fresh snow just begs to be thrown.